Sometimes, something happens that makes me realize why I love the animal sheltering world. Sometimes, something small can happen that makes a big difference. I was at work, when a couple was at the shelter looking for a Chihuahua. They had a Chihuahua mix with them, and they wanted a companion dog. There is no short supply of Chihuahuas in California shelters, and Best Friends is no exception. But this couple happened to be looking in particular for a small Chi, one no bigger than the one they had already, capping the weight at around eight pounds. Most Chi mixes are at least ten pounds, and they hadn’t seen anyone they liked yet. The couple was about to leave, ready to look elsewhere or come back another day, when that pesky little lightbulb of inspiration went off in my head, and I asked them to wait a moment. All shelters (that I know of) have “back rooms” or “inside rooms”. They’re just extra kennels, not open to the public, where animals are held for a number of reasons: they might need a vet exam, or are on hold for a possible owner, or perhaps they have behavioral issues that need to be worked on before they can be put up for adoption. And in many cases, the animals are there simply because they’re waiting for a kennel to open up in the main adoption area. At Best Friends, there are some inside kennels (although almost all of our adoptable dogs are “out on the floor”), and these are usually dogs that we have just pulled from the city shelters and will go on the floor in the next couple days, as soon as there’s room. They are still adoptable/available animals, but for obvious reasons, we want the animals that have been waiting longer to get adopted before the newer ones. There were a few Chis back in those kennels, and I decided it might be worth it to see if there was anyone who might fit what the couple was looking for. 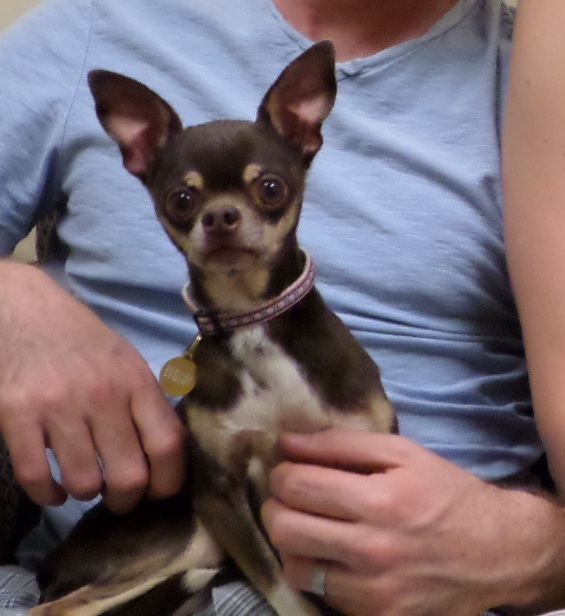 The only small Chihuahua we had, coming in at a thin six pounds, was a little chocolate and tan female named Pilar. I took Pilar out and her goofy expression and petite size immediately entranced the couple. She was extremely cute, had a great disposition, and was five-and-a-half years old. She was bow-legged. After looking through her medical files, it turned out that Pilar had some orthopedic issues that could potentially cost a lot of money down the line. She had been at a city shelter since April, and had lost a lot of weight during that time (probably due to stress). But she kept a sunny disposition despite it all. For most adopters, a medical issue is a major reason for not taking home an animal. So while I didn’t push the adopters one way or another, I was prepared for a “no”. However, the couple—who came from an animal rescue family (they had a blind cat, among others)—loved Pilar. The medical issues were a serious concern, but after speaking with our shelter vet, and having a long discussion with each other, they decided to adopt Pilar. Of course, it is the couple who deserves all the credit for taking on a special dog. But it sparked an appreciative acknowledgement in myself as well. If I hadn’t taken the extra time to check out the dogs available inside and picked out Pilar, this harder-to-adopt Chi could have spent a long time waiting for someone to take her home. Instead, she was with us for just three days.